TME’s offer now includes new AIMTEC AC/DC converters from AMEOF series which comprises three low power series: 1W, 3W and 5W. 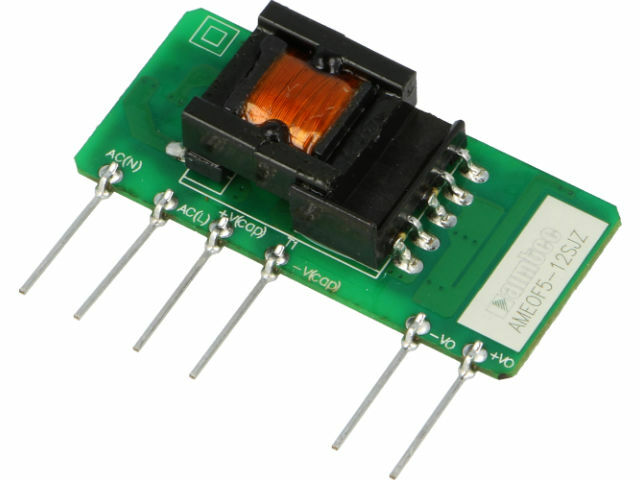 All converters are available in “open-frame” construction and are characterized by extremely small dimensions. Converters from AMEOF series are alternative to proven and well-known converters from AME1, AME3 and AME5 series, which are available in sealed enclosures but have larger dimensions. Low power consumption without load - <0.5W is an additional advantage; thanks to this fact, strict power consumption standards can be met. Similar to converters in sealed enclosures, converters from AMEOF series are characterized by I/O insulation voltage of 3000VAC. They are designed to operate in a wide temperature range: -40°C - +85°C (1W and 3W series) and -25°C - +85°C (5W series). Converters from AMEOF series operate within input voltage of 85 - 264VAC, and 70 - 400VDC (100 - 400VDC in case of 5W series); output voltage depends on the model and its value may be 3.3, 5, 9, 12, 15 or 24VDC. Converters from AMEOF series are equipped with additional protection circuits: short-circuit protection, overload protection and surge protection (5W version). Check out AIMTEC converters from AMEOF series available in TME’s offer!